This show is absolutely hilarious. I would recommend this cartoon series for anyone who is a fan of bizarre humor. 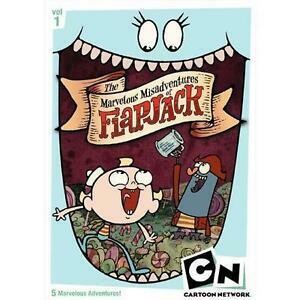 If you enjoy anything from Ren & Stimpy to Tim & Eric Awesome Show Great Job, you will love The Marvelous Misadventures of Flapjack. I was raised under a very liberal roof, so in my personal opinion, this is a cartoon appropriate for almost everyone (maybe not the little ones, but I don't think they would even remember what they saw to begin with). This is the first and only DVD of the series currently available, which is understandable; this is a fairly new show. Regardless, I completely recommend this show. Buy the DVD! I'm 25, and I love this show. I don't even have a kid. The animation is all hand drawn. They have shots of claymation, etc. The show uses puns a lot, and has some corny jokes. I love it. The storylines are pretty good. The voices are great. I do wish their were more episodes available on DVD. Oh yeah, the stories have good morals; it would be good for kids. Very artsy. I asked a 10-year old about the show. He said it was creepy. Best show ever, bummed it's no longer on.